Sport plays a vital role in community life and connects people in a unique way. Participating in community sporting activities is important to a sense of belonging. 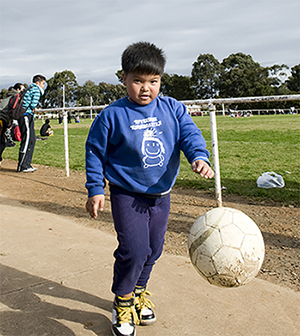 However, data shows that the participation rates for refugee and non-English speaking migrants in sports is significantly lower than for the general population and research indicates that children of culturally and linguistically diverse parents participate less in sporting activities than other young people. The Settlement Council of Australia identified a ‘lack of information around sporting opportunities’ as a significant barrier, which limits migrants and refugees engagement in sports. To address such barriers, the Centre for Culture, Ethnicity and Health is currently expanding the Health Translations Directory to include Sport and Recreation. The Directory is an online portal funded by the Victorian Government, which provides links to over 14, 000 translated resources produced in Australia, in over 100 languages. With close to 600 unique visitors daily, the Directory is an important tool for community workers, health professionals and communities as it is a fast and convenient way to access and share quality, up to date translated information. Currently, we have a growing range of sport related resources including the newly uploaded A Sport for All – Introduction to Cricket in 25 languages booklet. We would like to continue to expand the Directory’s Sport and Recreation categories. To do this, we need your help. Please contact us if: your organisation or club has produced translated information; you think there is a need for translated resources about your sport; you need assistance in developing new resources; or you would like further information on how to engage local migrant and refugee communities. Most importantly, we seek your support in promoting the Health Translations Directory to your networks, groups and local communities. This can be done by: featuring information and a link to the Directory on your website, facebook page or twitter account; including an item about the Directory in your newsletter; and displaying brochures in your clubs or at events. We could also promote any initiatives or ideas involving migrant or refugee communities’ participation in your sport through our newsletter. Our newsletter goes out to over 2, 000 members ranging from large hospitals, community organisations, ethno-specific agencies and state-wide bodies such as the Heart Foundation and the Cancer Council. Currently, our web analytics are showing that some of the most common searches on the Directory are ‘’physical activity’’ and ‘’the health benefits of exercise’’. This indicates that communities need and are looking for information relating to sport. We hope that you can support the Directory by helping us to build and increase sport related resources and by promoting the tool widely. In doing so, you will contribute to improved access to information and participation in sport for our culturally and linguistically diverse communities. Contact us if you think there is a need for translated resources, if you would like to promote the Directory or if you have translated resources. Email Mary Gavranic on maryg@ceh.org.au or call (03) 9418 9910.